Select from any of the training topic areas (below) to learn more about each course offering available at LEIC. If there is a course you do not see but would like training please contact us. The National Forensic Academy (NFA)™ is an intensive 10-week training program, designed to meet the needs of law enforcement agencies in evidence identification, collection, and preservation. The NFA is offered in-residence, utilizing curriculum developed by leading forensic practitioners from across the United States. Participants will be challenged in the various disciplines through classroom instruction, lab activities, and field practicums in the specialized courses. Academy participants will complete written and in-class competency exams to demonstrate mastery of the subject areas. The goal of the Academy is to prepare the crime scene investigator to recognize key elements and to improve the process of evidence recovery and submission. Click HERE to learn more. This course is designed to teach crime scene investigation techniques. 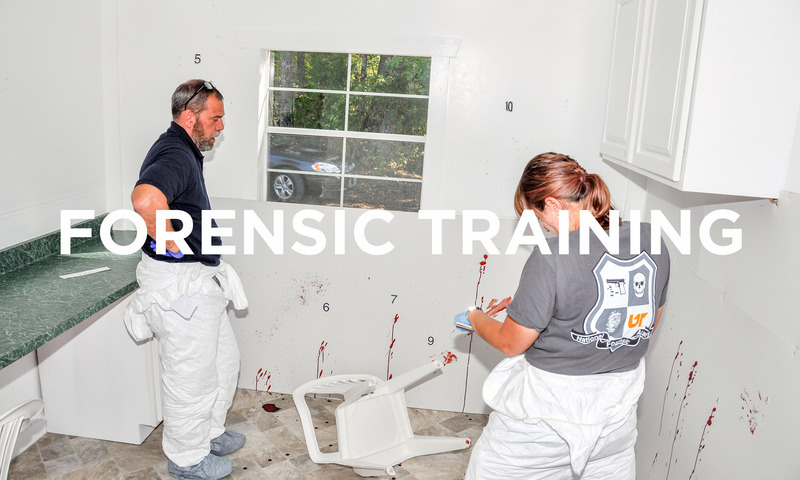 This hands-on training program offers both sworn and non-sworn crime scene investigators and technicians access to forensic evidence identification, documentation, collection, and preservation procedures. During this 40-hour block of instruction, participants receive hands-on training in the areas of DNA evidence, fingerprinting, field presumptive testing, photography, evidence collection and packaging, fundamentals of shooting scene, documentation, crime scene sketching, and more. This introductory level course blends facilitated learning and lecture periods with mock crime scenes and provides a safe and effective training environment for crime scene personnel. This training is facilitated by current instructors at the National Forensic Academy. This is a 32 hour class specifically designed for learning to better photograph evidence at the scene or in a laboratory setting. This course will teach you how to properly photograph a crime scene, bodily injuries, low-light photography, micro/macro (close-up) photography using copy stands and tripods, flash photography, photographing chemiluminescence in response to bloodstain documentation, how to photograph bloodstain evidence properly for a BPA examiner, photography of a shooting scene and photography of impression evidence. Participants will also be taught how to properly photograph latent prints, patent prints on reflective surfaces, and prints enhanced with dye stains under ALS. We will also cover photography using UV/IR light for gunshot residue and bloodstain evidence on dark clothing. This class is best suited for police officers, crime scene investigators, detectives, medical examiner/coroner investigators, forensic nurses, arson investigators and forensic lab techs. A basic working knowledge of your camera is desired but not necessary as we will teach fundamentals of the camera. A large portion of this class will be practical hands-on application. Required Equipment: DSLR camera, macro/micro lens (Nikon micro lens available by LEIC upon request), tripod (boom arm preferred), shutter release cable, flash cord and external flash. NOTE: LEIC has Nikon and Fuji Film cameras and equipment available if needed. You must notify tim.schade@tennessee.edu if a camera or any additional equipment will be needed prior to the class. New and emerging technologies for latent print visualization, collection, and documentation on various surfaces are taught in this course. Participants gain hands-on experience using the proper methods of recording fingerprints to ensure the prints contain useful data for analysis and comparison. This course explores the development, history, and advancement of bloodstain pattern interpretation. Participants learn to recognize, document, collect, preserve, and examine bloodstain pattern evidence. Successful graduates of this course are eligible for admission into the International Association of Bloodstain Pattern Analysts (IABPA). For more information, contact Dan Anselment at dan.anselment@tennessee.edu 865-946-3234 or Tim Schade at Tim.Schade@tennessee.edu and (865) 946-3236.